Cute extraterrestrials and lost socks are the theme of the latest online slot creation by Evoplay. The company has just announced E.T. Lost Socks, a five-reel, 21-payilne game that features the cute aliens that are on Earth to take your socks! On the reels, players will be introduced to four cute aliens and space gems. The aliens include a fiery red mad alien, a blue spike mohawk alien, a green ditzy alien and a goth style purple alien. Each alien will pay out a prize for a three, four or five symbol match on the reels. The space gems include red, blue, green and purple gems with each offering a payout for a three, four or five combo match. E.T. Lost Socks also includes wild and scatter symbols. The socks are wild in this game, substituting for other symbols except for the scatter. The substitutions help to create big jackpot wins. The scatter in the game is an alien in a spaceship. Three scatters on the reels will activate 10 extra spins. Scatters also offer multipliers for wins, with four providing 20x the win and five offering a whopping 50x the win. While spinning the reels, the extraterrestrials will also help to provide big wins. The purple alien will activate extra spins along with shifting wilds. 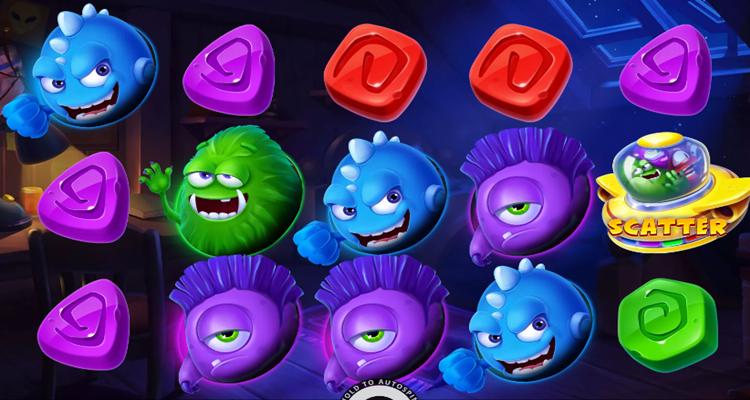 The green alien will offer extra spins with expanding wilds while the blue alien can offer extra spins with a replacement feature. With the blue alien and extra spins, all extraterrestrials on the reels are turned wild to help create a larger win! And let’s not leave out the red alien. This extraterrestrial will start extra spins and offer sticky wilds. Each wild that appears on the reels during the spins will become sticky an stay until the round is completed. With the new game, players have access to a quality title featuring the great graphics and animations that Evoplay is known for. Give the game a try today to see the many special features for yourself.